:Good Night Tales leads your children through a vivid, beautiful, and imaginative adventure through Scriptural truths. This collection of Scripture-based stories brings a forest to life through animal kings, trolls, plum-loving giants, and fiddle-playing crickets. Stories include reimaginings of Israel asking for a new king, parables about searching for the kingdom of God, and Psalm 23. 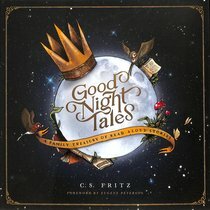 About "Good Night Tales: A Family Treasury of Read-Aloud Stories"